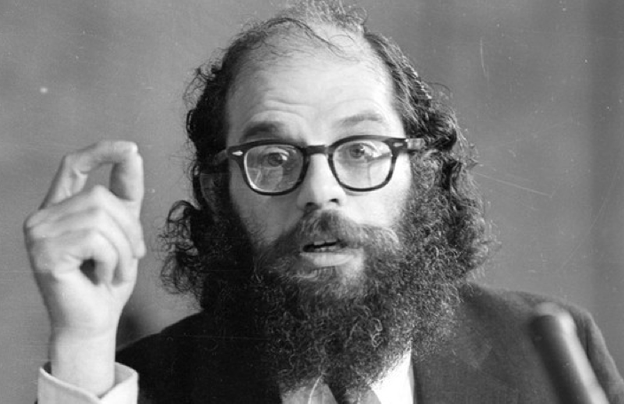 After a while, Allen Ginsberg enjoyed doing just about everything else but cigarette smoking. And he had the politics to support this one eventual self-prohibition, best expressed in his song called "Don't Smoke (Put Down Your Cigarette Rag)." Here is a RealAudio version of the recording, and here is an MP3 version. It's a 9 billion dollar capitalist joke. "Doctor," Ginsberg said to his very first psychiatrist in San Francisco, "I don't think you're going to find this very healthy and clear, but I really would like to stop working forever — never work again, never do anything like the kind of work I'm doing now — and do nothing but write poetry and have leisure to spend the day outdoors and go to museums and see friends. And I'd like to keep living with someone — maybe even a man — and explore relationships that way. And cultivate my perceptions, cultivate the visionary thing in me. Just a literary and quiet city-hermit existence." For me the most enjoyable aspect of understanding Ginsberg's writing is to deal straight on, feeling no need to reconcile them, with the two tendencies: stern (however hilarious otherwise) warnings against unethical or politically unconscious acts and ecstatic exploration of life-living resisting custom and normative behavior. In a sense this is the one biggest issue for experimental poetry from the dawn of modernism in the first 20th-century decade — the everyday politics of avant-gardism, how we can be liberated from ugly unbeautiful constraint while living with a new whole notion of communal and even personal rightness.